A video of a German lad, speaking in the Cebuano dialect like a native is doing the rounds online. 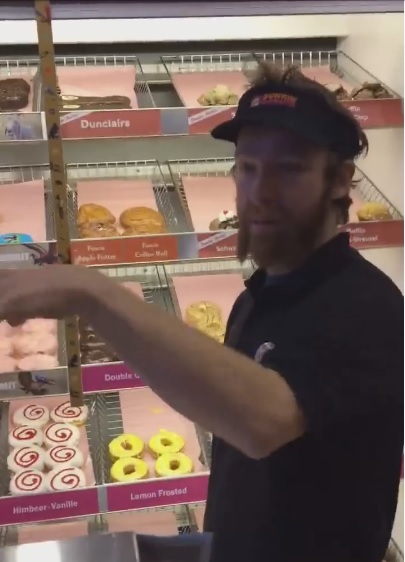 On a Facebook post shared by Cebu Flash Report today, January 28, 2016, the German lad can be heard talking to Cebuano speaking customers in a Dunkin Donut shop in Germany. The video lasted less than a minute, but it is enough to capture the hearts of the Cebuano-speaking netizens who were amazed by his mastery of the local dialect. The conversation revealed that the German lad picked up the dialect while studying in Cebu City. The German lad told his Cebuano customers that he took up Psychology in Cebu Doctor’s University. Unfortunately, he couldn’t practice his profession in his home country since his school records from Cebu is not acknowledged by his home country. When asked if he has any plans to pursue his studies, the German lad replied that as much as he wanted to, time is not a luxury because he needs to work to earn a living by selling donuts. He added that he hopes to find a way to remedy his problem with his school records in the future, but as of the moment, he needs to make money. When asked if he has plans to go back to Cebu, he said he is thinking of doing it next summer. And when the woman in the video commented that the beaches in Cebu are great, the German lad concurred with the woman’s statement. The video ended as they broke into laughter like old friends who lost contact for a good number of years. Hala ni graduate diha CebuDoc, Psychology graduate.Maayo kaayo mu bisaya! For sale voters database, registration records & biometrics? Atty. Glenn Chong detonates another b0mb against Comelec!